New Delhi/Gurugram, 31 October 2018: According to CMR’s India Mobile Handset Market Review Report for 3Q 2018, India mobile handset market recorded 9% sequential growth during the quarter. Smartphones grew sequentially by 29% where as Feature phone shipments improved by 24%. Fusion phones witnessed sequential decline of 41% . Make in India program is contributing to significant rise in domestic manufacturing of mobile handsets. The contribution of Indian domestic smartphone brands has increased sequentially by 2.5X during 3Q 2018. Micromax’s deal with Chhattisgarh Government to supply 5 million Smartphones has given it a fillip. If other Indian States were to follow suit, domestic smartphone players would see some positive tailwinds to return to growth, over the long-term. In 3Q 2018, CKD level manufacturing has surpassed SKD manufacturing. During the quarter, many smartphone brands went for aggressive launches, and contributing to the decreasing shelf-life of smartphone models. 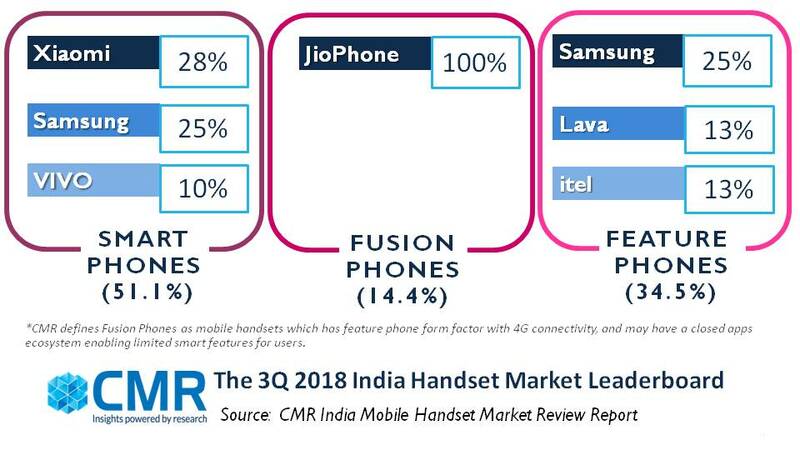 The Fusion Phones Segment is a new classification introduced by CMR to define mobile handsets that have a feature phone interface, possess 4G connectivity, and have a closed apps ecosystem enabling smart features for users.